Yahoo! Inc was found by Jerry Yang and David Filo in 1994 and later became incorporated in 1995. Recently in 2009 Yahoo! made the change of appointing Carol Bartz as CEO from Jerry Yang. They are in the internet and computer software industry. What Yahoo is most famous for is there search engine and its email service of Yahoo! Mail. Yahoo provides a variety of services through their website which allow end users to interact with their owned or operated websites. Basically Yahoo! can be broken down into four categories: integration of consumer experiences, Communication applications (email & IM) and communities, search engine, and marketing or services or products. How Yahoo Got its name? Yahoo actually was not the first name of its website. At first it was called "Jerry and David's Guide to the World Wide Web" but Jerry Yang and David Filo decided to change it called " Yet Another Hierarchial Officious Oracle" or in short Yahoo! In the year 2000 Yahoo! used Google results for its search. While Yahoo was using Google search results they were developing their own search engine and technology and in 2004 implemented their own search engine. Yahoo! provides a number of different ways to communicate with friends, family, or co-workers. They offer Yahoo! Mail, Yahoo! Messenger. Yahoo! has made its email service unlimited storage since 2007. They allow each email sent to allow files up to 25MB. Yahoo as expanded its services into the social networking scene by introducing Yahoo! Buzz, Yahoo Personals, Flickr, and Yahoo 360. Yahoo is providing mobile services of email, instant messaging, and blogging. They have also developed software that allows video chatting to Iphones and Android phones through the application of Yahoo instant messenger service. 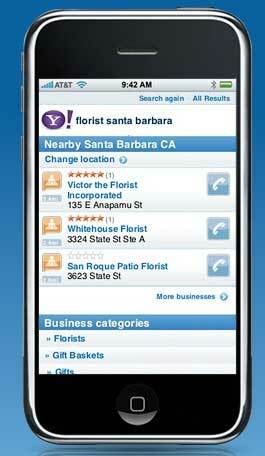 Yahoo mobile allows users to view sports, get instant search results, stock quotes, and RSS feeds. Yahoo! offers services of webhosting to customers. They offer domain for websites, Yahoo! business email, web hosting, and Yahoo! store for small online stores. These services can be particularly useful for small business owners and people that would like to open an online store. How Does Yahoo generates Revenue? Yahoo generates most of its revenue from search advertising. Search advertising is when advertisers bid for search terms to display their ads and company name on certain search result. Average Yahoo! made 2.5-3.1 cents on each search in the fiscal year of 2009 also 88% of Yahoo! revenue was from marketing services. Yahoo has seen its ups and downs, particularly with its stock price. At one time it was at an all time high of $188.75 a share in January 2000 with the dot com boom. With the dot come bubble burst its stocks reached an all time low of $8.11and optimism for Yahoo! Began to fade. A very interesting idea that Yahoo! has come up with is that they are planning to build a data center that will be powered by the Niagara Falls. The data center would be located in Lockport which is east of Buffalo. Up to 90% of the power generated will be going to the servers. This project will allow Yahoo! to save around $100 million over a 15-17 year period; the hydroelectric power is expected to give around 15 megawatts. Here below is a picture of the data center that has servers inside that are running off hydroelectric power! Below the below image shows all of the services that Yahoo! offers. Most of those services are Free! Yahoo does hire a quite a few San Jose State students of engineering or business related fields. If you interesting in applying click here.